Travel Safe Officers employed by the STM Agency on the London Overground (Arriva Rail London) contract will strike on 2 April. The workers, who do platform and on-train work for London Overground, face a pay freeze, despite already being low-paid. RMT will demonstrate outside Arriva Rail London's headquarters, next to Swiss Cottage Tube station, at 10am on 2 April. London Overground plans to remove all its staff from stations run by LUL from next month. At these stations - such as Canada Water and Highbury & Islington - Overground staff are an essential complement to Underground staff, dealing with incidents, last trains, passenger assistance and so on. Taking them away is an unacceptable cut to Overground jobs and an extra workload for Underground staff at those locations. Management of both companies are in a flap now their plans have been rumbled. We need more staff not fewer - and we can stop this cut! Read more about Wot No Overground Staff? Canada Water station (on the Jubilee Line and London Overground) is to be renamed "Buxton Water" for a day on Sunday 26 April, to tie in with Buxton's co-sponsorship of the London Marathon which takes place that day. This is the first time a Tube station has been named after a commercial sponsor. The wall roundels at Canada Water will all be changed, and special commercially-branded artwork will be added. TfL will be making a nice little profit out of the whole venture - around £110,000. 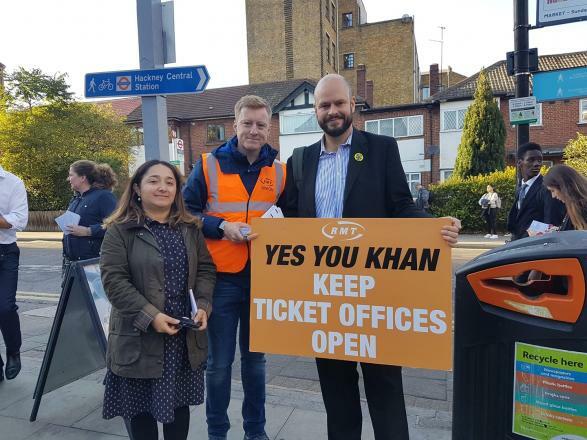 Two days of solid strike action have seen London Overground guards seriously crank up the momentum of their fight to save their jobs. There was well-organised picketing at all three booking-on locations - Willesden, Gospel Oak and Stratford - and very little scabbing. At least two drivers refused to cross the guards' picket line. (There is now a minuted agreement that people will not be disciplined for respecting picket lines - remember this when the next strike is held!). Click here to read and download a joint Tubeworker / Off The Rails bulletin for London Overground staff discussing the fight against job cuts. Hot on the heels of George Osborne announcing a 12.5% cut in Transport for London's funding, TfL franchisee London Overground has revealed that it is to scrap conductors. In fact, the company send a courier to deliver letters to conductors telling them that their jobs are to go. Thanks very much.